In the Food & Flight series, we dip into the Smithsonian-published Famous Personalities of Flight Cookbook to get a taste of our favorite characters in aviation and spaceflight. What better way to indulge in stories about air and space heroes than learning about their favorite recipes? Mock had a remarkable spirit of adventure. Although she was virtually unknown when she filed her round-the-world flight record with the National Aeronautic Association, she soon grabbed the world’s attention. Mock didn’t set out on this groundbreaking flight for the fame and glory. Instead, she sought the thrill of discovering new countries, cultures, and people. Casablanca, Morocco was the third pit stop in Mock’s journey. In her book Three-Eight Charlie, named after the Cessna 180 N1538C she flew around the world in, Mock describes the amazement she felt while experiencing Morocco for the first time. “Carved Moorish pillars spiraled to a high ceiling. A string trio played on a raised platform at one side. But the shapes of the instruments and the eerie sounds coming from them were vastly different from ours at home,” Mock writes in her book. In her time there, Mock learned about Muslim tradition, Moroccan music, and of course, delicious food. At dinner, Mock feasted on Ramadan soup, pigeon bastilla, and couscous. After dinner, the president of the Aero Club of Morocco welcomed Mock into his home, served her tea, and discussed airplanes with her until it was time for her to return to the French home she was staying in during her time there. Mock wrote about the world from a fresh perspective. She felt like she had stepped into a movie at times, and marveled at the bustling streets, brightly-colored dancers, and ancient marketplace that she found in Casablanca. On April 17, 1964, Jerrie and Charlie landed back in Columbus, completing their journey around the globe. Although her adventure was over, Mock brought back a little piece of her travels through the recipes she collected and the memories she shared in her book. 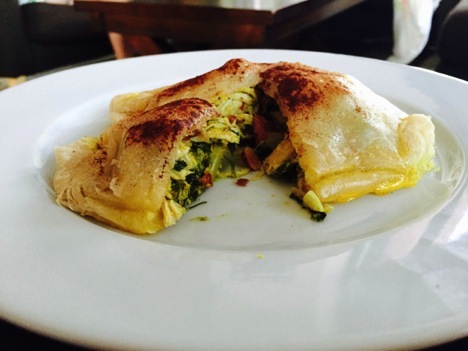 If you are brave enough to take on this bastilla recipe that Mock brought back with her, you just might experience some of the excitement and fascination Mock felt during her time in Morocco. The chicken, onion, parsley, and all of the spices simmer, almost ready to be assembled into bastilla. Photo courtesy of MaryCate Most. Combine all ingredients well. To store, firm with olive oil, cover tightly, and refrigerate. Brown chicken or pigeons in 6 tablespoons of the butter. Remove to a plate. Add onions to pan and cook until translucent. 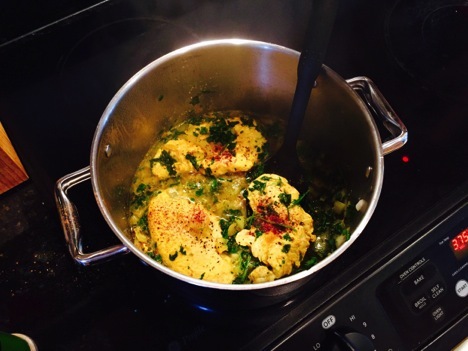 Add coriander, harissa, cumin, mint, parsley, ginger, saffron, salt, and ½ teaspoon cinnamon. Mix in water and bring to a boil. Return chicken to pan, cover, and cook over low heat until tender. Drain chicken and reserve broth. Cut meat into pieces about 2 inches by 1 inch, discarding bones and skin. Bring reserved broth to a boil. Beat eggs lightly and add, stirring until softly scrambled and most of broth is absorbed. Remove from heat. Brown chopped almonds in 4 tablespoons of the butter. Drain and mix with sugar and ½ teaspoon cinnamon. Spread 6 sheets of phyllo so they overlap in a circle, pinwheel fashion. Fold 2 sheets in half and place in center for reinforcement. Spread almond mixture in an 8-inch circle in the center of phyllo leaves. Cover with ½ of the egg mixture. Put pieces of chicken in a neat layer on top of this and cover with the rest of the eggs. Fold up center pieces of phyllo to encircle all layers of stuffing. Melt 8 tablespoons of butter and brush on exposed phyllo (open leaves) and fold each sheet up over the stuffing separately. Brush each sheet as you proceed. Before the last sheet of folded phyllo is pulled up, add 2 more folded sheets to the top of the stack to make the crust firmer. Melt 3 tablespoons butter with 3 tablespoons vegetable oil in a large, heavy skillet. Slide bastilla into skillet and brown over moderate heat. When golden, slide onto plate, place another plate over the top. Hold firmly and invert the plates and bastilla. Slide bastilla back into skillet and brown on other side. Sprinkle with powdered sugar and 3 teaspoons cinnamon. Cut in wedges to serve. The final, deliciously flavorful bastilla, just like Jerrie Mock used to make it. Photo courtesy of MaryCate Most.